I have received some great leads and feedback from yesterday's post about High Rock in York County. I'm still sorting through all of it and will prepare a followup post for the first half of this week. 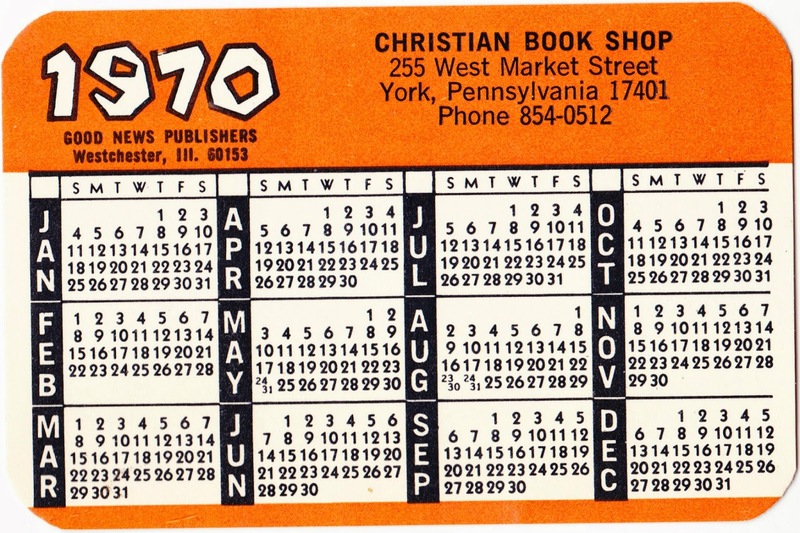 "The 1970 Christian Book Shop calendar brought back many memories. I had several of those calendars. "I remember the Christian Book Shop quite well. Before the Christian Book Shop opened in that location at 255 West Market Street, there was a neighborhood grocery store located there — at least from the late 1950s to the early 1960s, but it may have been there longer. It was known as Yost's Store. Mr. Yost not only operated the store, but also owned the building. My grandmother lived on the third floor and rented from him. I believe the store stood empty for a number of years after the grocery store closed and until the Christian Book Shop opened. "While the store was rather small, it was jam-packed full of Christian books, awards, jewelry, records, tapes and other items. Eventually the Christian Book Shop store at 255 West Market Street was too small to conduct a growing business and they moved about two blocks east toward the square. They moved into the former Cut Rate and later known as Super Shoes building, which is today occupied by the pawn shop [Pawn Plus]. "Actually, up until the early 1970s, Thompson's Book and Stationery Store at 35 West Market Street had a monopoly on Christian books, awards, Sunday School and Bible School curriculum, as well as business supplies, secular books, cards, and just about any stationery or office supply you needed. Starting in the 1970s, their business began falling and they eventually closed in the mid 1970s. "When the the Christian Book Shop was located at 255 West Market, they were a much friendlier and quaint Mom-and-Pop style store. Whenever stores become large, they lose that customer friendliness and camaraderie." Thanks for sharing, Jim! Your memory for these kind of details never ceases to astound me. "Often billed as York’s Oldest Bookstore, Thompson’s originally opened on August 25, 1899, at 49 West Market Street by Henry C. Barnhart and was known as 'Barnhart’s Book Store.' Mr. Barnhart was previously associated with John Baer and Sons, publishers of the Lancaster Almanac. The store moved to 35 West Market Street in August of 1915 when the Rosenmiller Building was completed. The store remained in this location until it closed in 1974. On March 15, 1935, Henry C. Barnhart died and a partnership was formed by Miss Helen L. Barnhart, daughter of the founder, and Arthur B. Thompson. On January 1, 1949, another change of ownership occurred when a new partnership occurred with Arthur B. Thompson and G. Marie Fetrow. The name of the store was changed to Thompson's Book and Stationery Store that same year. Arthur B. Thompson retired in 1955 and G. Marie Fetrow became the sole owner."